Welcome incoming freshmen, to the University of Wisconsin! Here at Wisconsin we have a tradition of winning in sports. In our two biggest sports, football and basketball, we consistently finish in the top 25 of the national rankings and have other sports that dominate their respective fields as well. Now that you chose to come to this great institution and are finally on campus, it is time to build up your student life by joining an athletic team. Joining a team on campus is a great way to build up your student life because of the amount of connections you can make. We have hundred of athletes on campus who all share the same bond of defending our schools honor in a sport against other schools. We also have many events to get to know people across different sports and get chances to build strong connections with alumni as well who can help you in the future. Also, you could earn yourself a full scholarship. Here at Wisconsin we have a rich tradition of walk-ons who went on to play professionally in their sport as well. since 1990 in football alone 19 players have walked on here and made it to the NFL. We also have a great opportunities to walk on other sports like men or women’s hockey, basketball, track, golf, or rowing. Playing on a varsity sport here at Wisconsin is one of the most fulfilling things you can do and will help you take your student life to a level that not many can achieve. 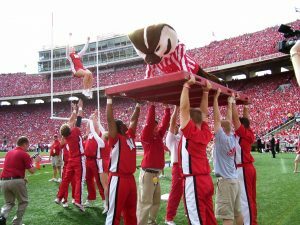 Join today and help us fight on for Bucky’s fame!